City of Derry Ladies have been left disappointed at the timing of the cup final postponement. City of Derry Rugby Club claim questions must be asked about how the Ladies game is being run in Ulster after the 11th hour postponement of Saturday's Junior Cup Final. Judges Road club, who had been due to take on Malone in the decider at Kingspan Stadium, say they are "outraged" after only being informed via email on Tuesday at 9.26pm that Malone's participation in an All Ireland League play-off - scheduled for Sunday, April 14th - means a different date must be found for the cup final. Acknowledging the need for IRFU fixtures to take precedence in such situations, a strongly worded City of Derry statement queried why the women's final was originally scheduled for April 13th, a decision, it claims, has left many within the club out of pocket and hugely disappointed. "The reason provided is that a few weeks ago the Branch discovered that the IRFU All Ireland League play-off will have to take precedence on April 14th," read the City of Derry statement, "The All Ireland play-off fixture is long standing, and was agreed and forwarded to all clubs at the beginning of the season. "Malone, to their credit, have won the Ulster League and deserve whole-heartedly to be representing the Ulster League by playing All Ireland Rugby and City of Derry RFC wish them every success. "However this does not quash the outrage currently being experienced at City of Derry RFC. Serious questions need to be asked about an organisation that would book the Kingspan Stadium with full knowledge that whoever won the Ulster Woman’s League would have to play on the day following the final. "Tickets have been sold. Final preparations were at an advanced stage. Players and supporters have made significant sacrifices to be available, such as children confirmations having to be rearranged, flights from England booked, hotel accommodation paid for in advance, buses booked, shifts changed, childminding organised and all to ensure maximum participation. "It is vital for the reputation of Ulster Rugby that they put steps in place to safeguard against any future oversights that will negatively impact on female rugby in Ulster." In response, the Ulster Branch said said it would work with both clubs to find a date for the re-fixed final but fell short of guaranteeing it would take place at Kingspan Stadium. "Due to a scheduling clash with the All Ireland League playoffs, the Ulster Women’s Junior Cup Final, which was scheduled to be played on Saturday 13th April, has been postponed," read the Ulster Branch Statement, "In such instances of scheduling clashes, IRFU competition fixtures have priority. 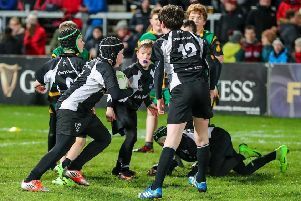 "The IRFU Ulster Branch Competitions Management Committee will work with both participating clubs to identify a mutually agreeable date to play the postponed final as soon as possible, while endeavouring to play the game at Kingspan Stadium."